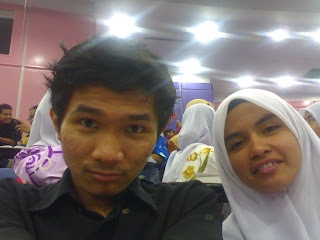 I sat next to Azalea and Daliah in DKA, hearing Mr Yeong Chua Bon's lecture. 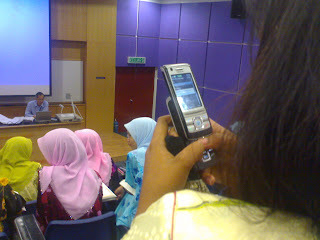 and Azalea kept on busying her life wit her HP... sms'ing her boyfriend kot... while Daliah concentrating wit the lecture given. 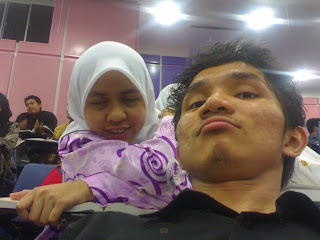 The class ended finally and Azalea tortured me by asking me to follow her see Puan Hamidah kot. So, I hav to go up the stairs (wit my injured leg), wait for that puan to finish her meeting (also wit my injured leg), follow her fax the letter and bla bla bla... then only she sent me back home.